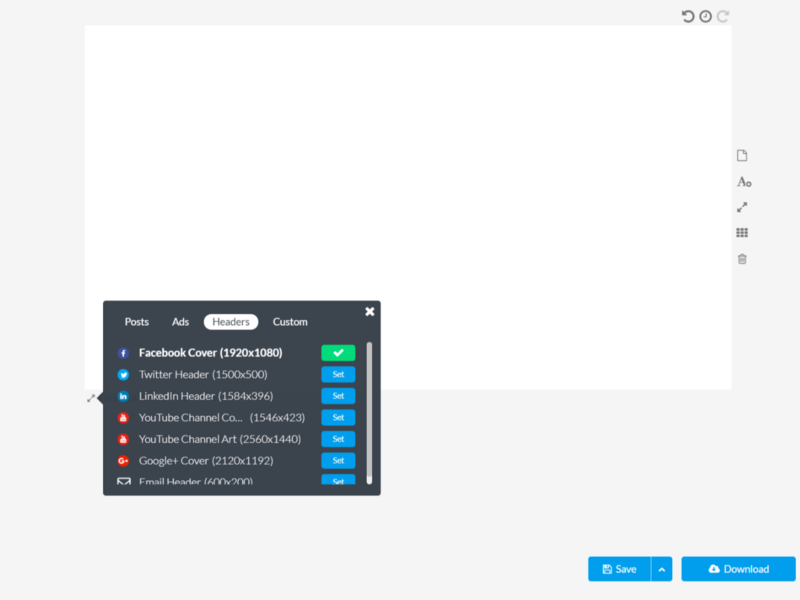 With all the changes in cover sizes and dimensions for various social media platform features, it’s a bit hard to keep up. Right?! Just a few months ago, there was an uproar on Facebook cover images. All of a sudden Facebook group covers were cut off and people were wondering what happened to their images. Social media managers were scrambling for the correct size and pulling their hair out wondering why Facebook didn’t even announce the new change. This happens all the time and Stencil has to stay on top of the changes. We’re happy to bring you some updates on Facebook cover and Instagram Story images plus some examples that can inspire you. So here’s the deal, Facebook is accommodating more for mobile and video overall and it’s only a matter of time that covers or headers will be optimized appropriately. The Facebook cover size is slightly taller and we recommend not having any text close to the edges because depending on what devices are used it can be cut off. 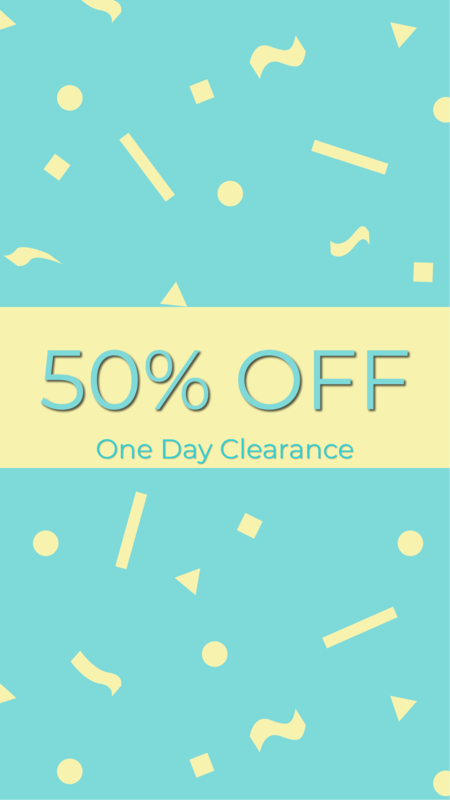 Facebook covers are great to advertise new deals and promotions, however, keep text closer to the middle of the image. You would think that you can get the correct dimensions straight from the source, Facebook. However, the dimensions they offer fall short and can leave some covers looking inadequate. Who can we trust to have the most up-to-date Facebook information, the Queen of Facebook, Mari Smith of course! While people were struggling to find the best cover sizes, she found the best Facebook cover size that’s perfect for all Facebook cover sizes with the best resolution (pages, profiles, and groups) is the almighty size of 1920 x 1080 pixels (16:9 ratio). After we’ve tested the dimensions on our own personal group covers and profiles, we set the dimensions in Stencil under Headers so everyone can easily make an image without the hassle of searching out what Facebook Cover size will be best. Quick note – it’s best to download the image as PNG because it looks a bit better than a JPG. What makes an inspiring Facebook Cover? It has to evoke emotion and keep in line with branding elements. Simple goes a long way for Hubspot! Simple goes a long way. Taking a photo and using emojis can be simple and on-brand. Louise does an excellent job of keeping in line with her signature brand color and font with a promo text. Mmm… sprinkles are always good! Yolanda kills it by promoting her book in the most delicious way. Remember to use the set dimensions in Stencil under Headers and find Facebook Cover templates to help you get started. Instagram Stories are a huge part of marketing a business. Did you know that? You can use them to promote a new blog post, promotional product, or lead magnet for your email list. Using images that are cohesive with your brand and being able to add the stickers can jazz up the images with a bit more creativity. You can spin off from your blog post image and size it to the Instagram Story size, which by the way, we have it size all set in Stencil. Of course, to get the nitty-gritty on marketing with Instagram, I always turn to Sue B. Zimmerman, the Instagram Expert. She provides all the cool updates Instagram constantly puts out to keep business professionals on top of their marketing game. She advises to do a video on Instagram Stories but what you can do is use static images in between video shots. Instagram Stories increases your exposure on Instagram. The more you do them Instagram will raise your reach. It’s so important to use IG Stories for marketing. You can let people know you have a new blog post up and spruce up the image that you create in Stencil and add stickers and GIFS right on the image. The more creative the better as people will most likely click on your profile. Remember to include text on the IG Story with your Instagram handle because they’re clickable. Bringing people in from IG Stories to your profile to click the link in your bio is your main goal. You can also include your link to your website address on the IG story. The more followers you have the more features you’ll get to access on a business account. 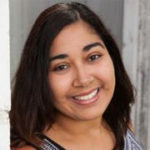 The Social Pros Podcast has Sue B. Zimmerman on to chat about “Why Stories Is the Key to Company Instagram Success Today” and she gives so much valuable information that you can’t miss (you can hear details about IG stories at the 39:24 mark – but listen to the whole thing there are SO many great tips). Here’s an example of one of our Instagram Story images to promote our Amazing Tips from Visual Marketing Experts blog post. We simply used the blog post image and converted it to the IG Story vertical size. Moved the headshots around of our experts then we were able to add some IG stickers for some flair. 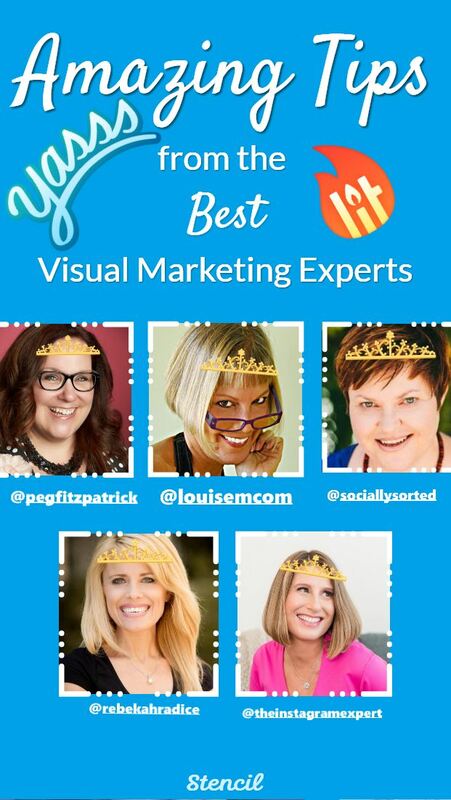 Of course, we had to add crowns on all of the visual marketing queens. LOL, it’s fun to use those stickers! Tag people who are in the blog post on the Instagram Story so they can remember to share the post. We’ve also added some Instagram Story templates in Stencil to get you started or if you already have an idea in mind just use the pre-set Instagram Story size (the size we use looks great on various devices). Download the image and place it on your camera roll for easy access to add to your Instagram Story. 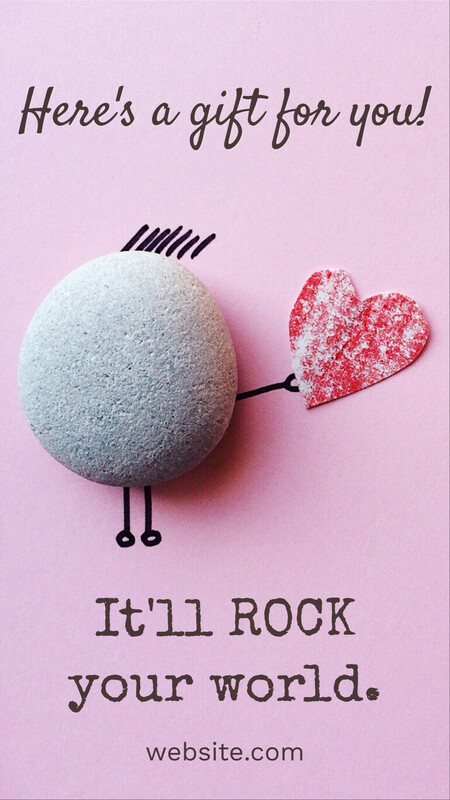 Rock your follower’s world with a special gift and gain someone on your email list. Use a fun promotional graphic! All you need to do is change the colors or fonts to your branding. The rest of the fun happens on Instagram when you add tags, URLs, hashtags, stickers, and/or GIFs. Do something creative and memorable! What are your plans for these new updates? Are you going to give the Facebook cover size a whirl and create an amazing image for your business? Will you try using Instagram Story images to ask questions, promote a product, or introduce a new blog post? There are so many ways to market a business with Facebook covers and Instagram Story images! Let us know what you plan to do in the comments.